A stunning and most individual three-bedroomed garden apartment offering very generous accommodation extending to about 2,000 square feet, forming part of this landmark building situated in a prime residential position, adjoining the famous Valley Gardens. 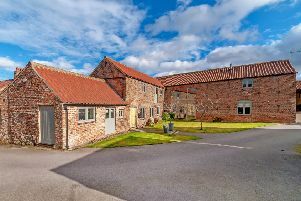 An internal viewing is strongly recommended to appreciate this property, according to agents Verity Frearson. Features include its own private entrance, many original period features. Contact Verity Frearson on 01423 562531.